There are almost 300 cultural monuments within the territory of Belgrade, among which 57 are of utmost and significant importance for the culture of Serbia and Belgrade. Three spatial cultural-historical ensembles (Knez Mihajlova Street, Topčider and area around Dositej’s Boarding School and the archaeological finds Belo Brdo in Vinča have been proclaimed the values of extraordinary importance, and three spatial ensembles (Gročanski bazaar - Bulevar Oslobođenja, Kosančićev Venac, old nucleus of Zemun) and two remarkable locations (Bojčin’s Forest and Commemorative Cemetery of Belgrade Liberators 1806) of great importance for the culture. The institutions for protection are responsible for some twenty archaeological finds throughout the City area. 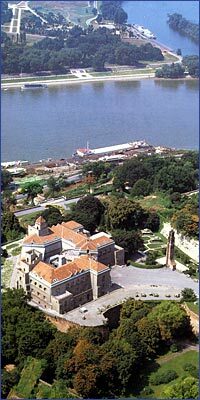 As for the facilities proclaimed natural treasures, the ones of major importance are: Belgrade Fortress, Saint Archangel Michael Cathedral Church, Thumb of the Unknown Soldier on Avala, Monument at the death spot of despot Stefan Lazarević (Crkvine near Mladenovac), Cemetery of Belgrade Liberators, late Roman Tomb in Brestovik, Log-built church in Vranić, Birth Home of Voivode Stepa Stepanović, Palace of the Duchess Ljubica, Captain Miša’s Edifice. The beauty of Belgrade squares and public gardens in ten town municipalities is supplemented by 192 monuments and 237 sculptures. About 70 monuments and works of sculpture are located in the outlaying municipalities. The area of the City of Belgrade preserves 37 protected natural treasures, out of which the majority accounts for long-living and rare trees. Among them is the Quercus robur Melnice in the Sopot municipality village Nemenikuće, over 230 years old. There also is the group of nine oak trees with the Jazić’s hut in Obrenovac, about 180 years old, followed by plane tree planted at the time of building of Palace of the Duke Miloš Obrenović in 1834 and a century-old cedar tree planted by Josif Pančić in Tolstojeva Street in the municipality of Savski venac. Among the protected natural values there also are Banjica’s Forest, the nestling spot of over 70 species of birds, "Maša’s Mine" near Summer Stage in Topčider (geological set layer from the upper Cretaous Age), "Myocene’s sand-shelf" at Tašmajdan and "Sea Neogene’s sandbank" underneath the “Liberator” Monument on Kalemegdan, representing the remnants of the Mediterranean basin of Pannonian Sea. Memorial natural monuments are: Bojčin’s forest within the area of Zemun and the Arched Ash Tree in the Šopići village near Lazarevac (Šopići’s Grove). Veliko ratno ostrvo (Big War Island) on the Danube, the habitat of rare and endangered birds of marsh and the representative morphological and geological formation, is under the protection of the government.